If you love the shave a safety razor offers and travel a lot, you don’t need to compromise by going for disposable ones while on the road. A safety razor travel case is the way to go. 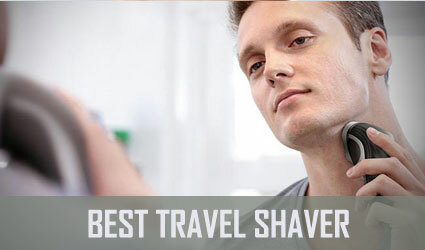 For this article, we gathered the best-rated safety razor travel cases with at least 3.3 stars and at least 4 customer reviews and sorted them in ascending order considering their average customer rating. We also analyzed their materials, size, and overall quality. 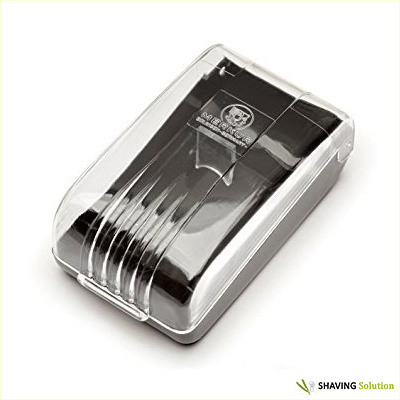 This safety razor travel case by Merkur is made from clear and black embossed plastic and measures 3.9 x 1.6 x 2.4 inches. It can fit short handle safety razors by Merkur, specifically the 11, 15, 30, 33, 34, 37, and the Progress safety razors. Customers who purchased this case mention it’s sturdy and well made, even though from plastic. However, many are unhappy about its size. Nevertheless, if you have one of the aforementioned models from Merkur, they will fit perfectly inside. we will update this page as soon as it comes back! As an alternative, you might want to check out this safety razor kit by Merkur that also comes with a hard case and 10 blades! This safety razor hard case for Merkur razors is made of premium EVA material and has a classic zippered closing system. 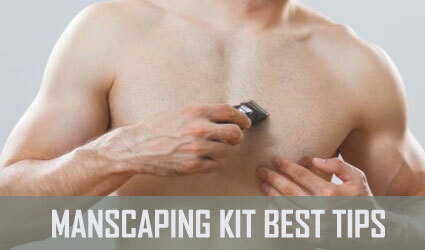 In addition, it also features an inside mesh pocket for storing spare razor blades. It’s a long-lasting, high-quality case that is also easy to clean according to customer reviews. The safety razor stays in place thanks to the designated cavity that firmly holds it so it won’t slide out during transportation. This case by SimplyBeautiful is made from faux leather and measures 4 x 1 x 1 inches, which makes it the shortest on this list. It will be able to fit short handled razors mostly from Merkur, but if you have a long-handled one, you should skip to the next products. Customers also mentioned they had to readjust the top of this case to fit a thick-handled razor. Reviews also mention this case is made from thick and high-quality faux leather and has a good design. 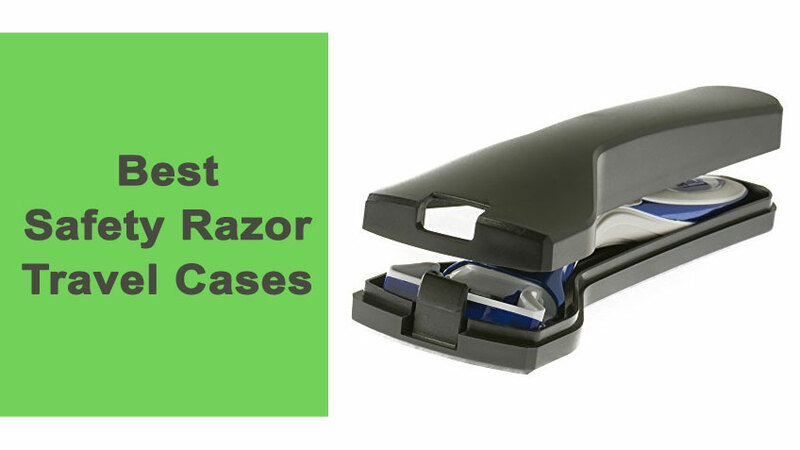 However, some customers also note the craft of this case is not the best; some cases have the closure clasp exposed and scratching the razor, while others are simply poorly made according to reviews. This simple but sturdy safety razor travel case is made by MD Barber supply, known among professional barbers for their shaving products and accessories. 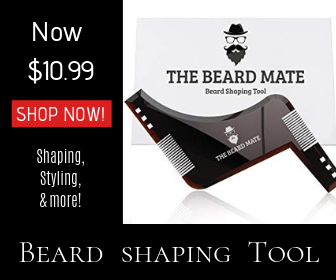 It measures 8 x 5 x 0.1 inches and claims to fit any type of razor. 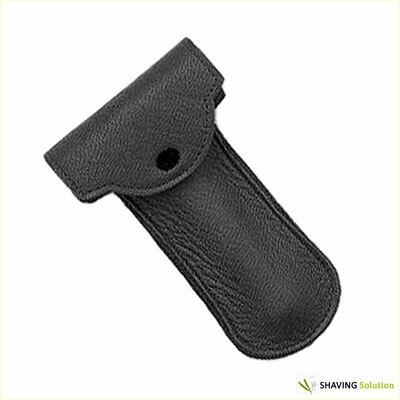 MD’s case has an elastic loop that keeps the razor in one place for safety and a metallic zipper. 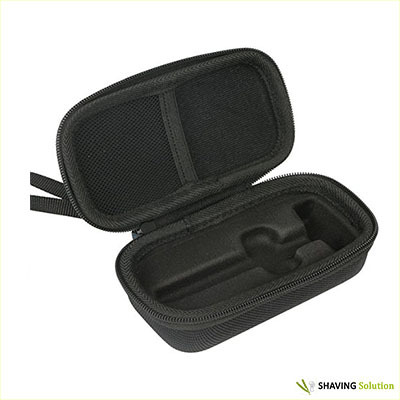 The inside of this case has a padded design to protect your razor from shock and scratches. One drawback is that it’s not made from real leather, but most customers mention this a durable product that’s an excellent value for money. It’s portable enough to carry or to store in a bag and durable enough to be well worth the price. Parker’s travel case is the perfect entry-level case for the man just getting into safety razors. This little case is great to slip into your gym bag or briefcase, and won’t break the bank. 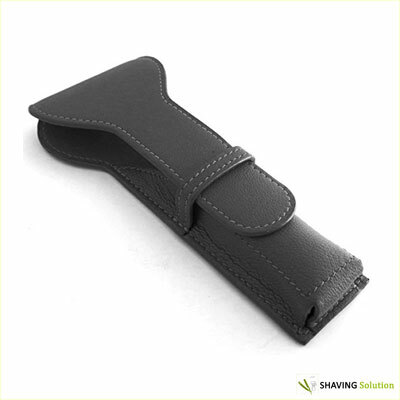 It has a separate compartment for the blade so that you don’t cut yourself and fits both long- and short-handle razors. 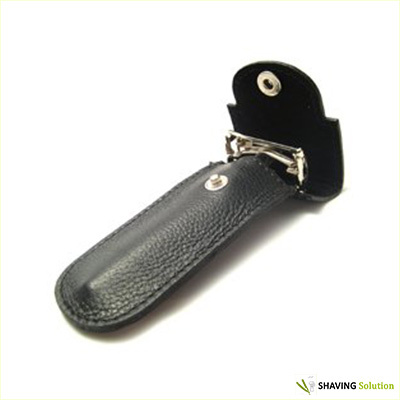 The snap-lock design keeps you and your razor safe.  Although no info is available on the product dimensions of this case, the manufacturer states it fits most products from manufacturers like Parker, Gillette, or Merkur and reviews confirm this aspect. Another highly appreciated feature of this case was the material: it’s made from genuine leather which makes it long-lasting. 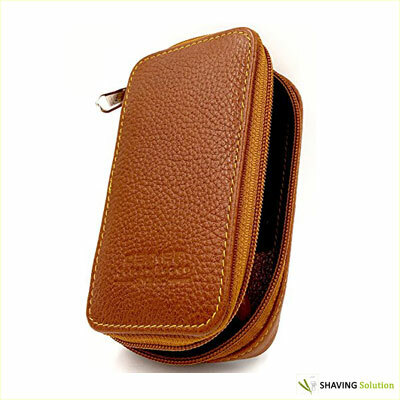 This safety razor travel case is made from real sheep Napa leather which makes it soft and extremely durable. It has an extra compartment to store the blades and is a high-quality item overall. It’s made from full-grain high-quality leather that has been died and tanned with natural salts. It measures 6 x 2.5 x 0.75 inches, thus being able to fit long handle safety razors. Reviews are very positive for the most part, but some users found that the fit was too loose with smaller razors. 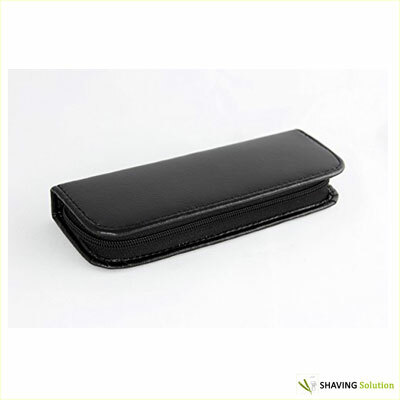 If you are looking for a high-quality leather safety razor travel case, this is the ideal travel case to buy. Be sure, however, to check it before buying to make sure that it fits the razor you have. This safety razor is made of high-quality saddle leather case and can fit standard safety razors with handles of up to 5 inches. It features manual stitching and comes with genuine YKK zippers which add to the quality and classic look and feel of this product. It has a snap-tongue mechanism that keeps the blades securely tucked in the case during travel. This inside of this case measures about 5 inches in length, meaning it can accommodate most safety razor models currently on the market. According to customer reviews, the craftsmanship of this case is impressive and makes for a long-lasting product. This is, hands down, the best safety razor travel case currently available. Recommended read: If you are looking for a new safety razor to go with this elegant safety razor travel case, you can look over our review of the best safety razors currently available online. Although there aren’t many quality safety razor travel cases available for online purchase, our article gathered the absolute best. Both choices by Parker are reliable, and we also liked the Premier Rasage option as it seems well-made. 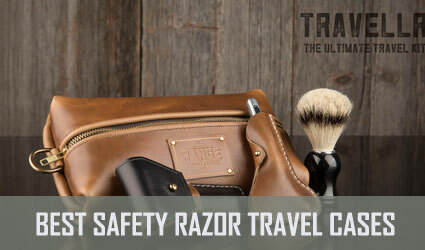 What’s your experience with safety razor travel cases?